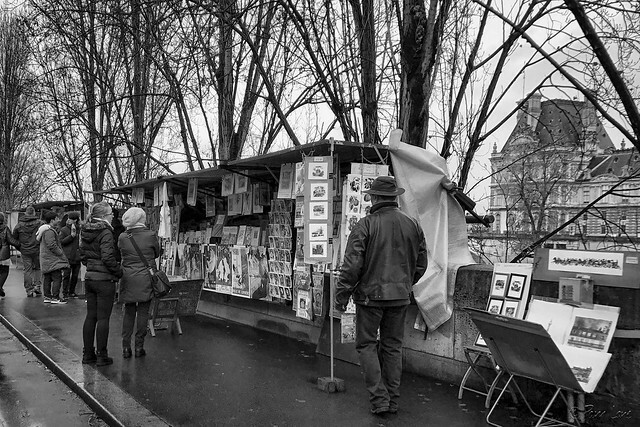 The booksellers of Paris line the Seine even in winter. In fact, they're part of what makes Paris feel like Paris! According to Wikipedia, "The bouquinistes of Paris, France, are booksellers of used and antiquarian books who ply their trade along large sections of the banks of the Seine...The tradition of the second-hand booksellers began around the 16th century with little market peddlers. Under pressure from booksellers, a settlement of 1649 prohibited stalls and the display of books on the Pont Neuf. The authorities at the time were rather anxious to limit parallel markets not subjected to official censorship. Travelling booksellers during the period were driven out and then reinstated under approval."